Let the gift of time show her how you feel. From dancing diamonds to a playful moon phase, these are the perfect instruments to reignite the romance. Nothing says passion like the colour red, and this De Ville Trésor is looking especially captivating in the bold hue. The 36mm timepiece features a red dial and leather strap, embellished with a diamond-set bezel and a crown decorated with an image of a flower made up of five Omega logos in red liquid ceramic. The caseback is polished to a mirror shine, and decorated with the floral “Her Time” pattern. The 33mm red gold case houses one of the most whimsical moon phases – a smiling face with a beauty spot, Blancpain's nod to an 18th century trend when women decorated their faces with an artificial mole. The mother-of-pearl dial is decorated with eight brilliant-cut diamonds with red gold hour markers for ‘3’, ‘6’, ‘’9’ and ‘12’, and features slender leaf-shaped hour-and-minute hands. More interesting are the seconds hand shaped like a Cupid’s arrow and a fourth hand with a heart-shaped tip for indicating the dates. Limited to only 99 pieces, it comes with interchangeable red and white straps. Chopard’s signature dancing diamonds are as captivating as it sounds, and this Happy Hearts timepiece features two movable big hearts, one crafted of white gold and set with diamonds, and the other in bright red. These dancing hearts are complemented with three dancing diamonds. The famous arched doorway of Harry Winston’s Fifth Avenue flagship boutique in New York inspires the Art Deco rectangular case. For Valentine’s Day, its distinctive shape is embellished with 48 brilliant-cut diamonds with a dial of floating red hearts, and complemented with a red ruby on the crown. Limited to 14 pieces, the red alligator strap boasts 18k white gold ardillon buckle set with six brilliant-cut diamonds. For something out of the norm, check out this Tiffany & Co. watch with a design based on a travel clock from the 1940s. Oozing retro chic, the East West 2-Hand features a dial that presents a unique way of reading time – yes, it’s unusual but that’s what makes it so interesting. The latest version comes in the classic Tiffany blue (with a touch of white), making this a proposition that is simply hard to resist. 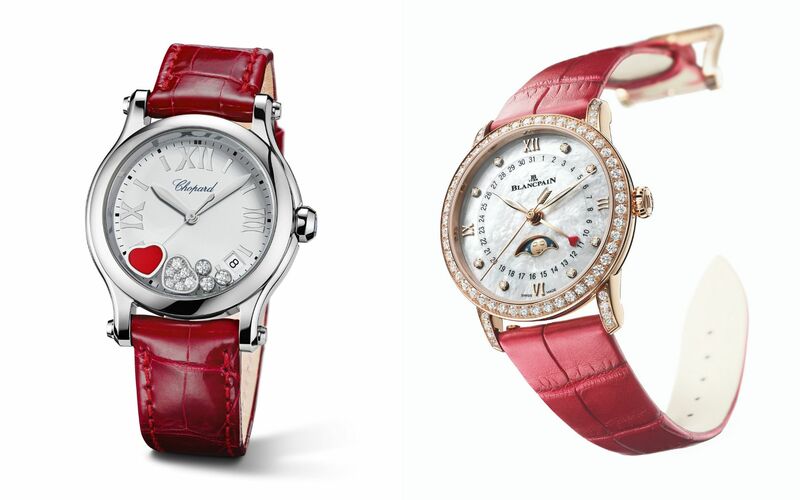 Watches & Jewellery Valentine's Day Omega Chopard Blancpain Harry Winston Tiffany & Co.